You peer intently at the SHADOWY FIGURE on the back of the SAND WORM. Oh. It's a VULTURE. And, boy, it is going to town on that CARCASS. Just... just going to town on it. RHYS: Hey, can I have that knife? GWC: No. My GEORGE WASHINGTON CARVING KNIVES were forged specifically for me by HEPHAESTUS, the GOD OF THE FORGE. RHYS: You mean the blacksmith in WESTERN TOWN? GWC: What? No, the GOD OF THE FORGE, not some random blacksmith. RHYS: Fine. . . . Man, look at that VULTURE. He's just going to town on that thing. GWC: Better stay away from my knife, if he knows what's good for him. RHYS: The SAND WORM is probably good for him. Chock full of VITAMINS and MINERALS. GWC: You are a strange little man. >Ask for SAND WORM REPELLENT, sneak erratically toward SAND WORM, use HANDKERCHIEF to tame VULTURE, and name VULTURE "Baron Von Vulchey"
You've been through so much to get to this moment. Syhr stands before you, one pistol pointed at you, the other.... 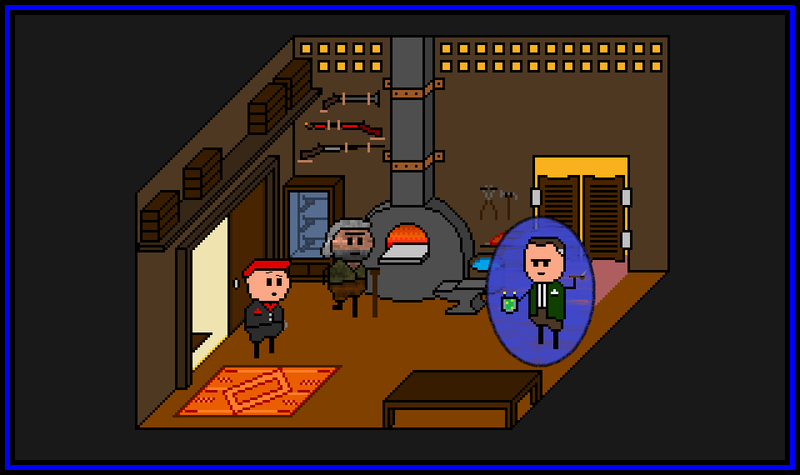 The red laser sight gleams, even in the bright warehouse, resting unwaveringly on Teddy's face. You've been searching for him since he was kidnapped, so long ago, by the bandits, long before the cloning, the moonbase, the nuclear debacle, and the revenge of the Rokkiteers. But you've assembled all of the Teddy Boar Gang to rescue their brother from Syhr and the Shadow Bison Armada. Above you, Specs is on the catwalk. The Sheriff is coming through the door now, followed by the Postman. Feral Scope is providing overwatch from a box, his twitchy trigger hoof a millimeter from ending it all. 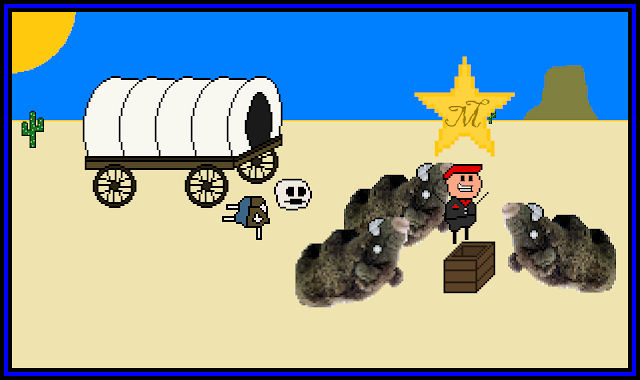 The Mauser Twins came too, after you made it up to them for killing their brother, the Mauser Triplet. You broke Toy Box out of prison, needing his explosive expertise to get into Syhr's base. Buckaroo watches General Balrog, Syhr's right hoof; no doubt Buckaroo wants revenge for that scar over his eye. And there's Tiny with his bazooka; he may have betrayed you to Mueller, but gods help him, he wants Teddy back as much as any of you. This is it. The final showdown with the time-traveling clone that set this all up, so long ago in the future. SYHR: It's too bad you came all this way just to die, brother. SYHR: Oh, I will. Just as soon as you give me the Code! RHYS: We both know that's not gonna happen. SYHR: Do you think you're fast enough to take me out? Faster than your genetically-enhanced clone? RHYS: Oh, I don't think I'm faster. I don't need to be. SYHR: What are you talking about? 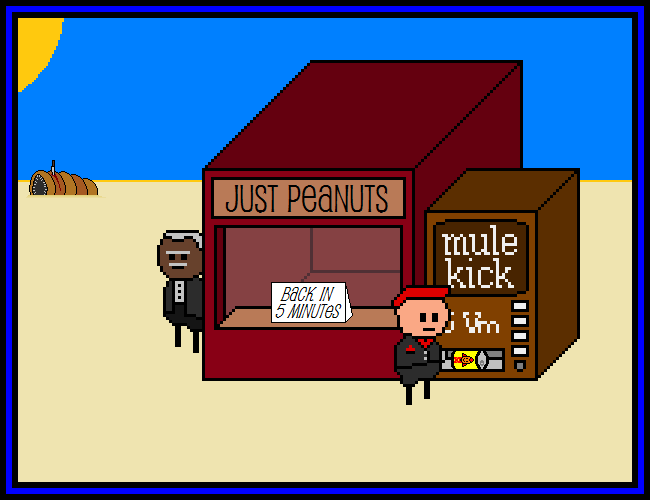 You use the PEANUT DEUS EX MACHINA MACHINE. 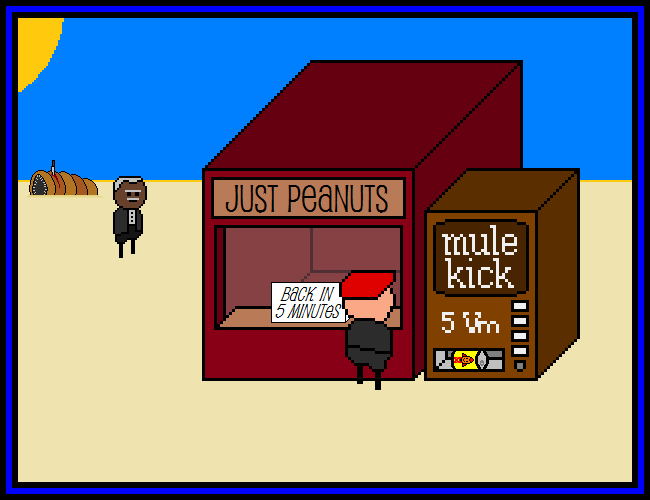 RHYS: How much for the PEANUT DEUS EX MACHINA MACHINE? You check your WALLET ANALOGUE. Only 49. Dang. RHYS: How much would you give me for this... SAUCY LITERATURE. RHYS: (Checking) It's... oh my... SAMBAL KACANG. GWC: Ooooooh. I'll give you one VARIOUS MONIES for it. RHYS: Done. Here's 49 more VARIOUS MONIES and I'll take the P.D.E.M.M! RHYS: Is... is this a LUNCHBOX? GWC: Yes, but it's what's inside that counts. I don't know what's inside, beyond the fact that it's peanut based or peanut related. It's based on the HEISENBERG UNCERTAINTY PRINCIPLE as applied to a NANO-PEANUT MATRIX. If at some point you are completely stuck beyond the shadow of hope, whip that thing open and presto--- exactly what you need. Or, at least, an item or items of possible need. Probably. Unless you look. RHYS: How do you even make something like this? RHYS: Whatev's. Let's move on. Which way to FORT FERRIS? GWC: You were heading the right direction. Just keep going like you were going. RHYS: WHAT IS UP WITH THAT FREAKING SAND WORM? GWC: Hum? Oh, they're attracted to peanuts. I usually have to... slice and dice. RHYS: Does this happen often? Oh, yeah, you better pick that back up. That nefarious plan goes against your newly rediscovered creed. The SHOPKEEPER seems confused by the ROKKIT JUICE CAN that you just pulled from the MULE KICK VENDING MACHINE CAN RETRIEVAL AREA. GWC: Did you just pull that Rokkit Juice from the Mule Kick machine? RHYS: ...yes. But it's not what it looks like! GWC: It looks like that machine just gave you the wrong drink. RHYS: No! I just put it there... for... to keep it cool? GWC: It's all right. Vended wrong. Happens from time to time. I'll get you a free Mule Kick soon. 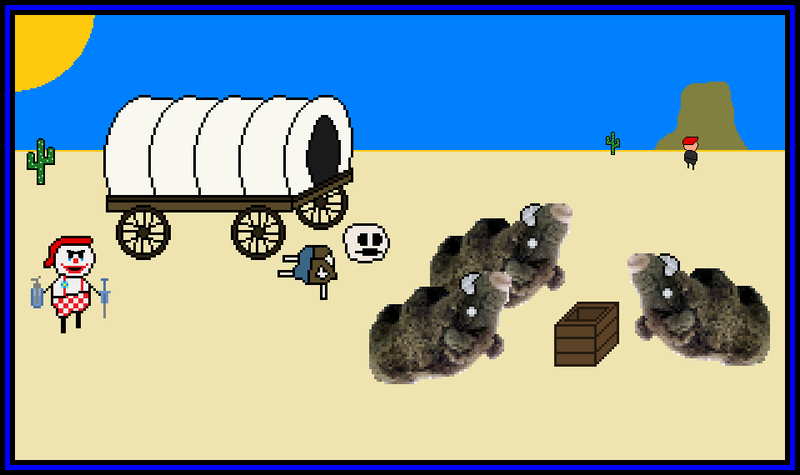 Anyway, what brings you to my little corner of the desert, son? GWC: You came to the right place! I've got all sorts of neat peanut-based technology! A short list of which includes peanuts, peanut brittle, peanut oil, peanut butter, peanut shaving cream, peanut plastics, peanut shoe polish, peanut grease, peanut fuel, peanut rope, peanut clothing, peanut paint, peanut lipstick, peanut nitroglycerin, peanut mayonnaise, peanut coffee, peanut milk substitute, peanut DNA substitute, peanut bombers, peanut moonshine, peanut hair tonic, peanutsicles, peanut playing cards, peanut boar repellent, peanut spray paint, peanut packing peanuts, peanut circus peanuts (the orange peanut-sugar candies), peanut glue, peanut deus ex machina devices, peanut drones, peanut armor, peanut flour, peanut cutlery, peanut cell phone, peanut laptop, peanut crystal ball, peanut insecticide, peanut action figures, peanut shelving units, peanut laxatives, peanut wax, and even peanut-derived epinephrine. RHYS: Right. I'ma gonna ask you some non-peanut related questions now while I try to wrap my peanut head around that list (which I had not previously formulated in my head). You pause, momentarily taken aback by the thoughtless hypocrisy you might have committed. Who are you? What have you become? The thoughts flow quickly, raging, a torrent of emotion, comprehension, and grief over the path of darkness that may have overtaken you. Who are you? Are you the kind of person that would just go ahead and snag SOMETHING when no one was looking? NO! You are a MARSHAL, for the gods sakes, appointed by the people winds of fate to defend the DEFENSELESS! You are a PARAGON of UPRIGHTNESS and TRUSTWORTHINESS. Stealing is so far beneath you that you had to bury a grave for the grave that you originally placed it in to get extra downward distance; that's how far below you it is! You purge that thought from your MIND as soon as it enters, cursing your SUBCONSCIOUS, that it would or could even harbor such a THOUGHT! Who are you? You are Marshal Rhys O'Callahan. And you and JUSTICE are holding hands, about to leave for a double date with CRIME and THE CRIMINAL ELEMENT. And if your GUN has anything to say about it, that element... is HOT LEAD. You emerge victory the mental battle! You then imagine yourself in some SWEET PEANUT ARMOR, because, dang SKIPPY, that would be freaking sweet. You are PEANUT MAN (Dun-na-Na-na-Na-na-naa Na Na Naaaa)! Yeah. The SHOPKEEPER will be back any second now. ...you check inside the STRUCTURE for anything that isn't nailed down. There is quite a bit, but as the SIGN would indicate, it's JUST PEANUTS. A short list (not capitalized because you decide to scan with your indoor voice) of the items would include the following: Peanuts, peanut brittle, peanut oil, peanut butter, peanut shaving cream, peanut plastics, peanut shoe polish, peanut grease, peanut fuel, peanut rope, peanut clothing, peanut paint, peanut lipstick, peanut nitroglycerin, peanut mayonnaise, peanut coffee, peanut milk substitute, peanut DNA substitute, peanut bombers, peanut moonshine, peanut hair tonic, peanutsicles, peanut playing cards, peanut boar repellent, peanut spray paint, peanut packing peanuts, peanut circus peanuts (the orange peanut-sugar candies), peanut glue, peanut drones, peanut armor, peanut flour, peanut cutlery, peanut cell phone, peanut laptop, peanut insecticide, peanut action figures, peanut shelving units, peanut laxatives, peanut wax, and peanut-derived epinephrine (now with extra peanut!). Anything you want to snag before the SHOPKEEPER gets back? 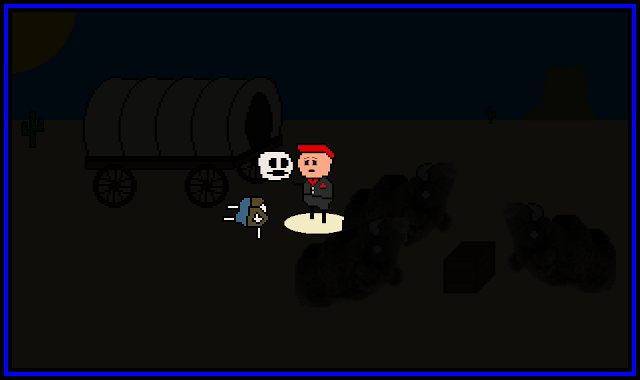 You look for further random encounters on your way to FORT FERRIS. It's not like you have any pressing need to get there. Seeing a small, random structure in the distance, you approach. 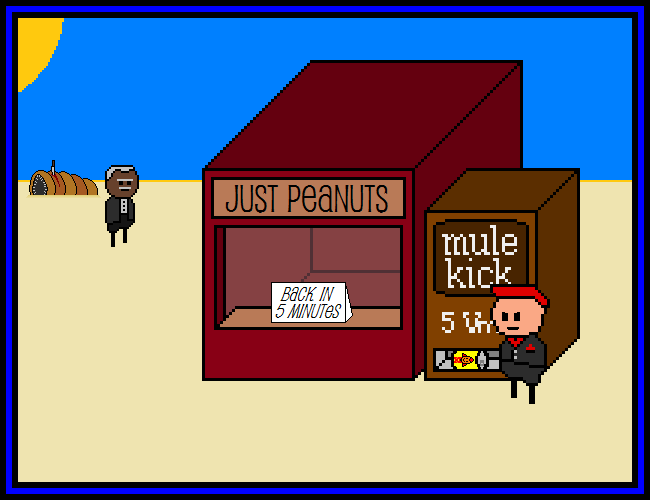 You are standing in front of a small STAND with a sign reading "JUST PEANUTS". A smaller SIGN implies that the SHOPKEEPER will be back in five minutes. 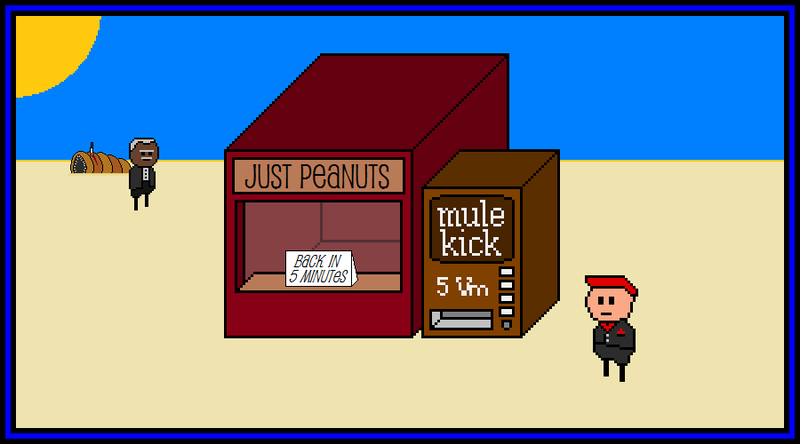 Beside the STAND you see another MULE KICK VENDING MACHINE. You're not that thirsty yet... are you? 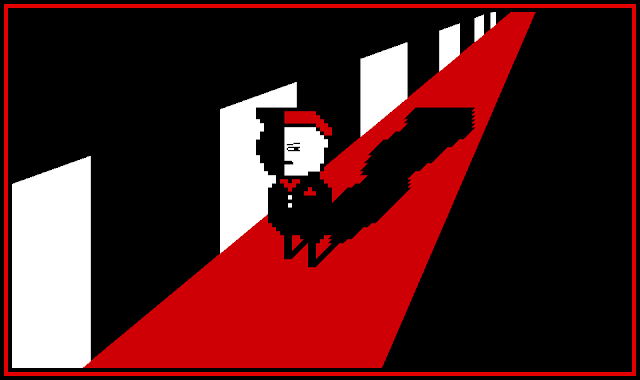 In the distance, you believe you see the SHOPKEEPER coming back towards you. Behind him is a stabbed, bloody, and presumably dead FREAKING SAND WORM. It looks like you have a minute* before the SHOPKEEPER gets back. *Equivalent, most likely, to one turn. Well, nothing more for you here. The BOARS... are beyond your power to heal and FORT FERRIS awaits. Yup. Nothing more for you here. And definitely no reason to turn around and look behind you at any point. No reason at all. COULROPHOBIA CLOWN assesses the situation, bearing SELTZER WATER and EPINEPHRINE. He does so maniacally. Enough of this TOM Q. FOOLERY. You've solved the PUZZLE in your HEAD, now it's time to put it in the BOX and take your reward! You got: BACKUP MARSHAL'S STAR! Now people will trust your duplicitous claims of MARSHAL-HOOD even more! These BOARS must be so proud. You decide to take a short respite from the love's labour of solving the PUZZLE BOX, as you like it but, measure for measure, right now you'd like to relax in the only other way you know how. Half-remembering SHAKESPEARE while holding the poor GENTLEMAN (possibly of VERONA)'s SKULL. Boaratio. A fellow of infinite vest, of most excellent shirt and pantsy. He bore that shirt on his back a thousand times. And now how abhorred in my imagination it is! It's ripped! My gorge rises at it. Here hung those lips I assume that were once soft. Where is your breathing now? Your exhales? Your sentience? or a boar? No one now will mock your grinning, save I. You look dumb. Bleachy died, Bleachy was not buried, Bleachy returneth into dust, eventually. He hath nothing to loot, oh, what indignity, not even a bare bodkin. verily, the butter of the peanut and tawdry brickabrack t'were all that remained. There are more things in heaven and earth, Boaratio, but must be looted elsewhere. lend me your ears, uh, not to bury Bleachy but to... happy dagger? This POOR GENTLEMAN is quite dead and has been thoroughly picked over. There is a bit of his shirt which has been torn off, right over his heart. You wonder what could have been there? Who was this man? How did he die? So many questions! And nothing to help the BOARS! Better check YE OLDE BOX. There are four REELS on the LOCKING MECHANISM. Each as a series of DIGITS from 0 to 9. The NOTE has five hints. 1. The second digit is the lowest. 2. The last digit is the highest. 3. The third digit is even. 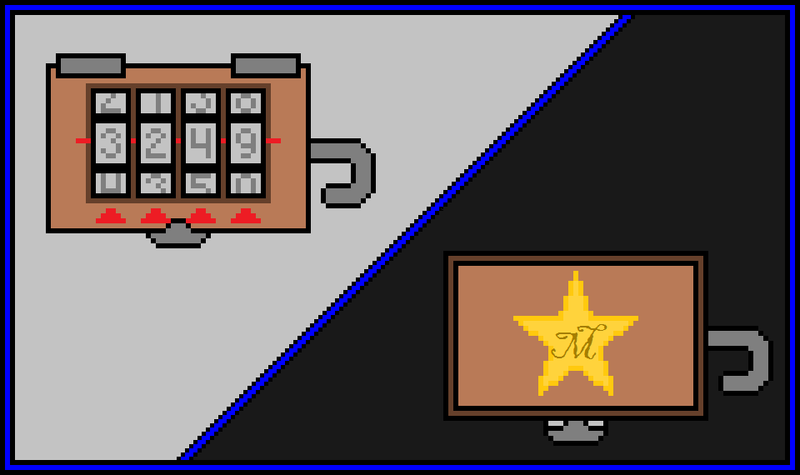 You are the JUNIOR EXECUTIVE VICE PRESIDENT IN CHARGE OF GETTING THINGS DONE (SLASH MARSHAL) and it is time to do your JOB, which is GETTING SEVERAL THINGS DONE. Step One: Get RED RUBBER STOPPER. That is total puzzle-bait right there and it must be yours. Step Three: Shoot PEANUT BOMBER at TEDDY BOARS! That should scare them off without doing them any lasting harm! Oh... oh, no. How could you forget? Teddy once mentioned that all TEDDY BOARS are DANGEROUSLY ALLERGIC to PEANUTS. Oh, the HUMANITY. Or, maybe, the BOARANITY. Or something. Still really tragic. They're not dead, but they're gonna be in EXTREME SUS SCROFA STUFFICA ANAPHYLAXIC SHOCK for quite a while! This... oh, this is really pretty sad. 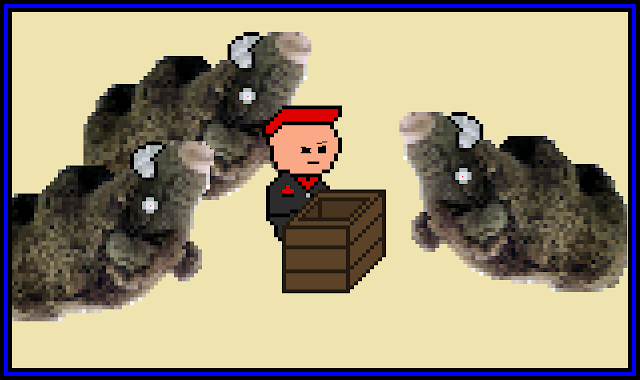 The BOX is now unprotected (unless you count the quietly shaking, immobile, largely unconcious BOARS. But you don't have to. Really. They're out of it. Because you're a jerk. Man, TEDDY might be angry when he hears about this. They might be his family. Oh, man. They might be like his brothers or something. Or... sisters? Man, you do not want to check. Focus on the BOX. Focus). 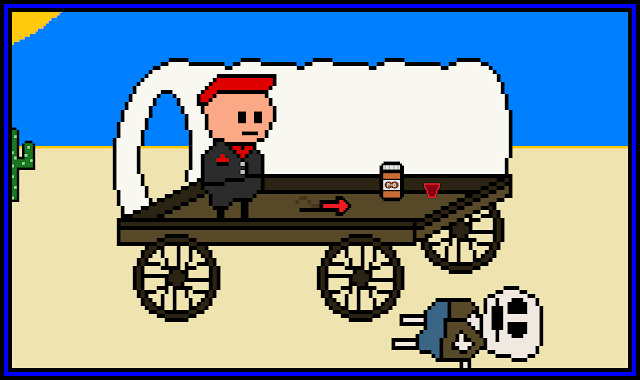 After traveling through the desert for longer than expected, you see a COVERED WAGON in the distance and make for it. Might as well, since your knowledge of where FORT FERRIS is could be considered sketchy at best ("that way"). 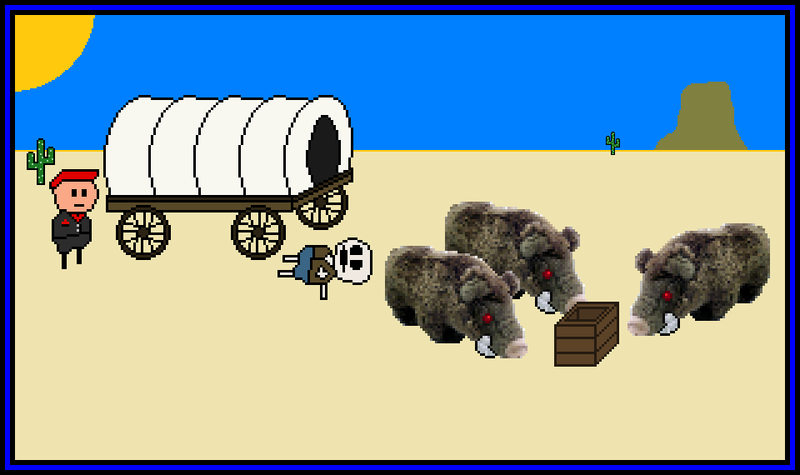 When you reach the COVERED WAGON, you realize that you've just stumbled upon three large FERAL TEDDY BOARS, which are indigenous to this region after some misguided toy-making/toy-breeding accident many years ago. They are congregating around an OPEN BOX, which you can only assume holds SOMETHING important. The BOARS do not seem to have noticed you yet, and you plan on keeping it that way. In front of the WAGON is a bleached SKELETON. You assume it was the late owner of the WAGON before some tragic accident. Hoping to avoid the BOARS and get your BEARINGS, you hop into the back of the WAGON and look around. It looks as though PREVIOUS SCAVENGERS have picked over the WAGON'S CONTENTS pretty thoroughly. All that's left in here is a FIREWORK, a JAR OF PEANUT BUTTER, and a RED RUBBER STOPPER. 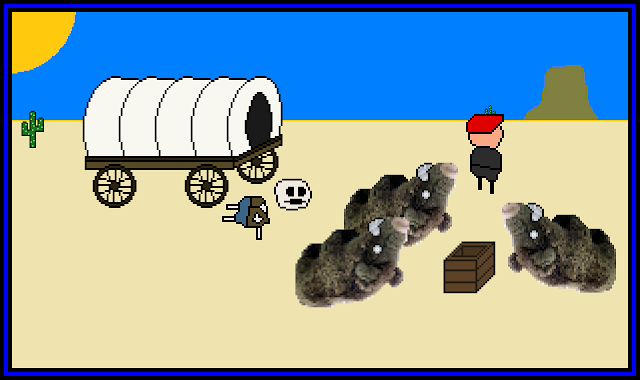 The FERAL TEDDY BOARS are still snuffling around the BOX outside, and it doesn't sound like they have any intention of leaving soon. You decide that you've had enough EXPOSITION to last you several turns, so you're going to just go ahead and skip town. Ninja Style. You head outside. You continue to the east and-- hey! There's the MALL that the ENGINEER mentioned. 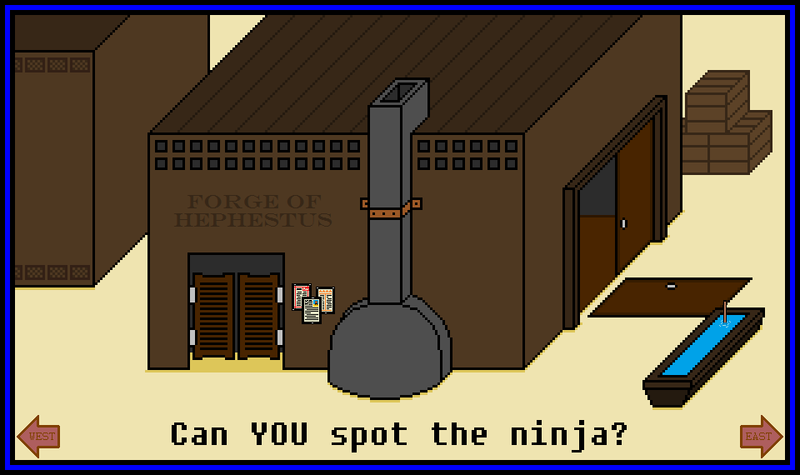 But the NINJA does not solve PUZZLES! Not even SUDOKU. Besides, it'll still be there when you get back. You stealth onward. You decide to ignore your brief, tempestuous foray into the black, white and red and get back down to business. Specifically, the business of stocking up on ammunition. 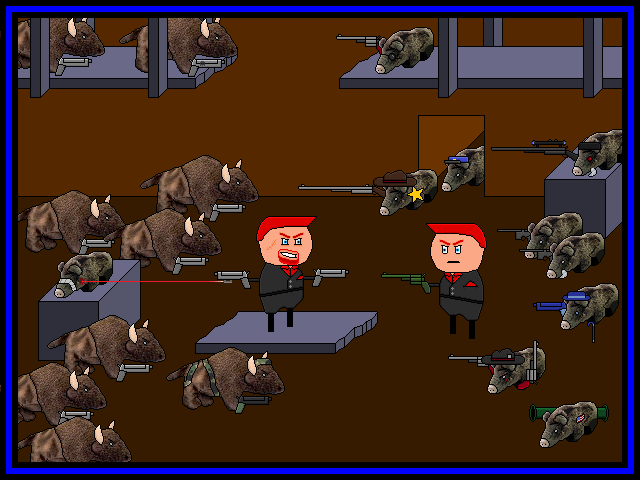 RHYS: I can haz BULLETS? HEPH: You don't need 'em, Marshal. There are only four times when ammunition will come up and they are as follows. One: when you are fighting zombies or horror monsters. 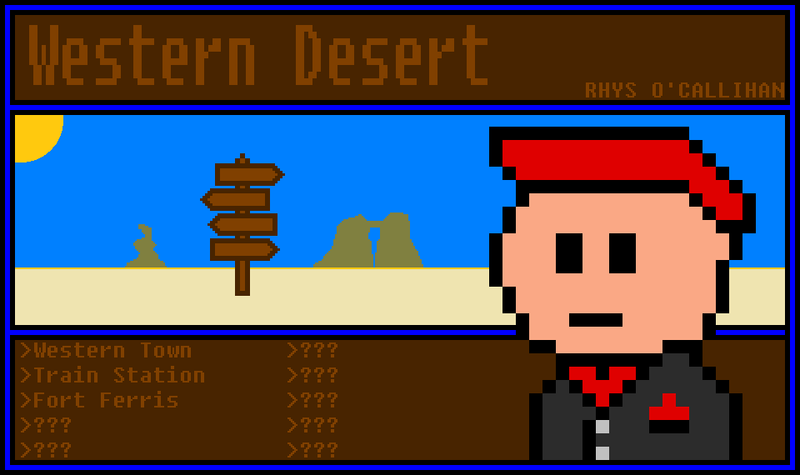 Two: when you're lost in the desert for a while. 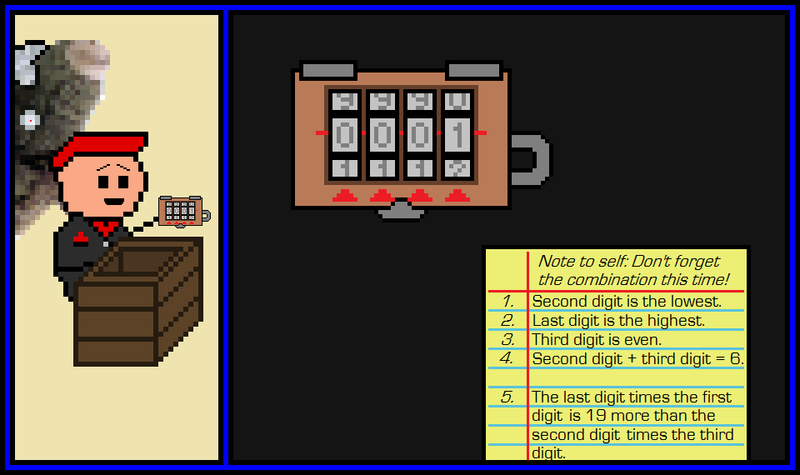 Three: whenever a puzzle demands limitations. Four: when it's really dramatic. RHYS: This is kind of meta. HEPH: I know, son. I know. There's nothing you can do about it, though, so why don't you just run along and adventure? 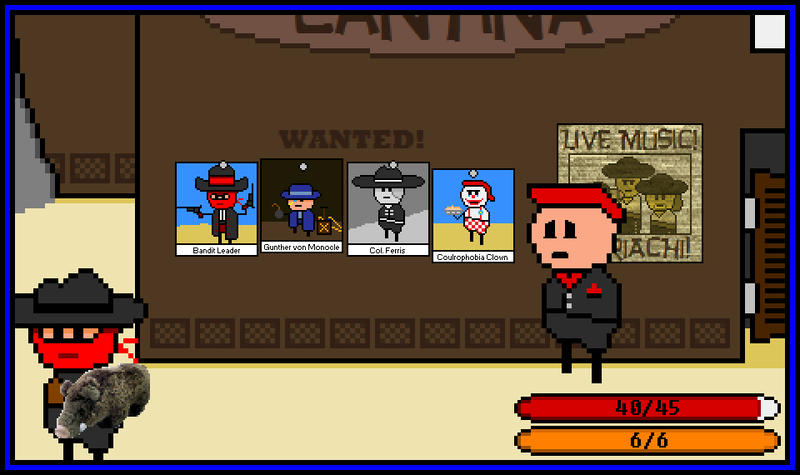 You flash back into NOIR MODE for a second as you count your BULLETS (or try to; they're infinite at present). Then you come back to NORMAL MODE and go about your BUSINESS. You now trust no one except for your close friends ALAN, JILL, CAD and TEDDY. You briefly consider trying to fix the DOOR, but you have no TOOLS nor SKILL AT CARPENTRY, so that doesn't seem very likely. Instead, you head back inside to talk to HEPHAESTUS. You take a moment to examine the BLACKSMITH'S SMITHY. You just entered through the BROKEN DOORS. A set of SWINGING DOORS is across the room. 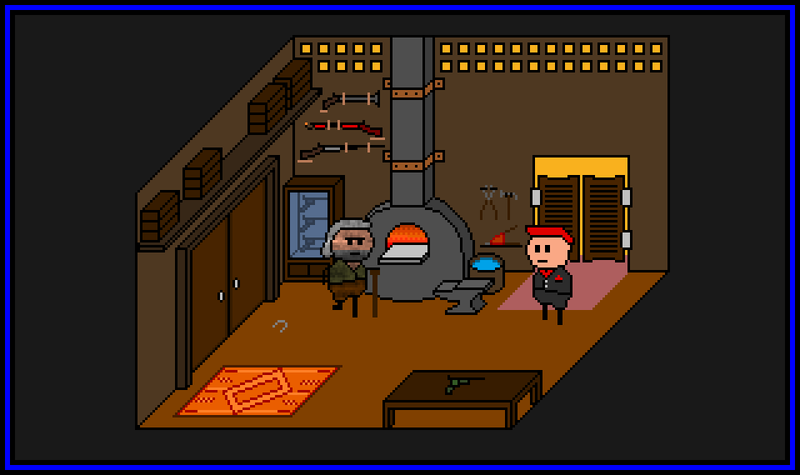 HEPHAESTUS stands beside his FORGE, near an ANVIL and a BUCKET OF WATER. On the wall are various BLACKSMITH'S TOOLS, including TONGS, a HAMMER, and BELLOWS. Lower in the room, you can see a TABLE (from whence you "borrowed" your PISTOL) and a PRETTY SWEET ETHNIC RUG. 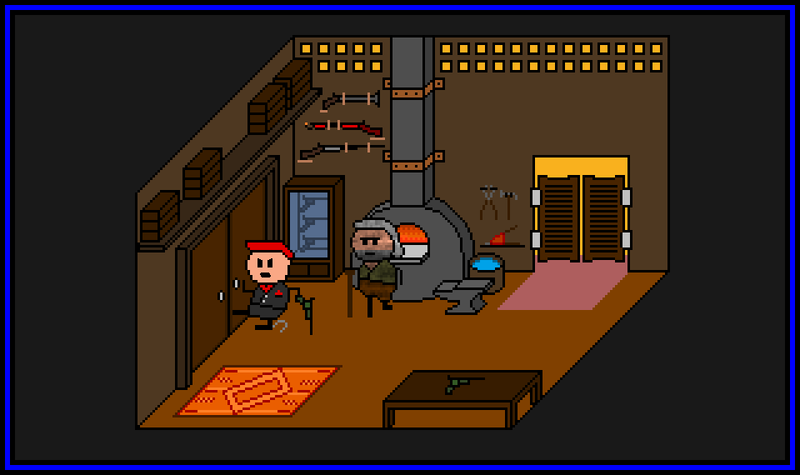 Of greatest interest however is the collection of FIREARMS in the PISTOL CABINET and on the WALL. Niiiiiiiice. RHYS: Hey, so, nice to meet you and all. Sorry about the DOOR, but, I mean, dang. That was a pretty sweet kick, wasn't it? I mean, that was some fundamentally sound heroism right there. RHYS: So, I found 22 VARIOUS MONIES on that BANDIT. Would that cover the DOOR repair? HEPH: That should do it. RHYS: There you go. Anyway, I'm MARSHAL RHYS O'CALLAHAN. Nice to meet you. HEPH: Nice to meet you. 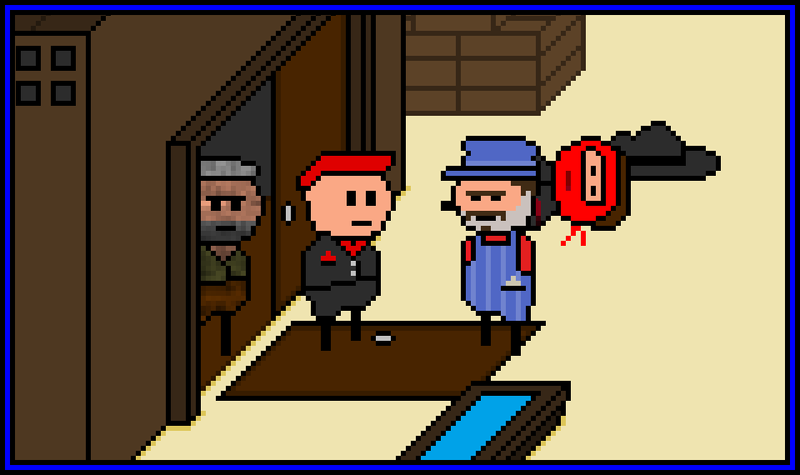 I'm HEPHAESTUS, Western Town's local blacksmith. HEPH: Yes. You're standing in Western Town, the town farthest west in the entire world. RHYS: Nifty! What's there to do around town? ALAN: Oh, hey again Rhys, Hephaestus. I think I got the locational function stabilized, but the temporal whatsit is still all over the place. ALAN: What? Oh, yes. Hum. Is this the first time you've encountered me? ALAN: Hum. From my personal chronology, I've already met you twice now. Oh, Jill says hello, as does Cad. ALAN: Indeed, to the south and north, respectively. RHYS: I thought I was all alone! This is great! ALAN: Hum, quite. Anywhat, the next jump is coming up, so I guess I should give you the message from yourself. RHYS: Uh, sure, tell me! RHYS: Who? Not to trust who? ALAN! HEPH: Blasted time-travelers. Scorched my FLOOR! RHYS: This is great, though! I'm not alone! My friends are here! Somewhere! RHYS: That too. Man, this is great. 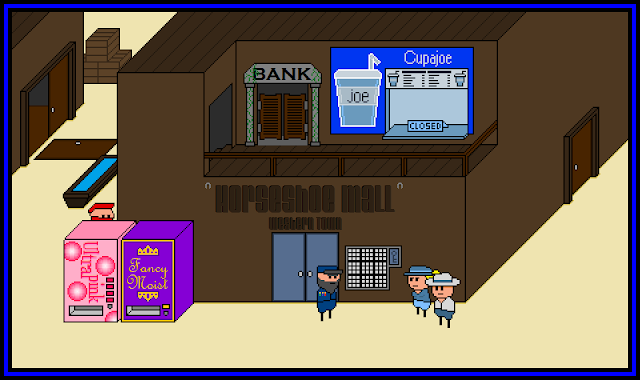 HEPH: Anyway, here in town you can find the CANTINA, the ABANDONED MINE (BLOCKED), the FORGE OF HEPHESTUS (SIC), the WESTERN MALL, and the STABLES. Once you get out of town there are various places you can go, such as the TRAIN STATION, CEMETERY HILL, or my suggestion for you, FORT FERRIS. HEPH: There, you could find COLONEL FERRIS, a wanted criminal, and defeat his army of CONFEDERBOTS, evil Confederate Robots. RHYS: But what about BANDITS? HEPH: If you want to go after them right away, you could try the PERPETUAL TRAIN ROBBERY. They're always there. But if you want a better weapon (you can keep that piece of junk you "borrowed"), I'd suggest going after FERRIS. RHYS: Good to know. . . . Man, wasn't that awesome when ALAN teleported in? I mean, "bamf!" RHYS: . . . bamf! So cool! . . . so cool! . . . so cool! You and the ENGINEER shuffle awkwardly. He retains his blank stare. RHYS: So--- oh, no. That... that wasn't consensual, right? ENG: Naw. He w's tryin' t' take mah VM. RHYS: I know you mean VARIOUS MONIES, but give me a moment to think of other, more humorous possibilities. RHYS: . . . OK. Heh. Anyway, umm...you're welcome! For the save and all. Y'all right? RHYS: Great. Any idea why he was robbing you? RHYS: Yeah, I guess it was pretty straightforward. Man. That was my first combat. How do you think I did? RHYS: Just all right? Do you think you could do any better? RHYS: Oh? Are you really? Why didn't you defend yourself, then? He was going to kill you! RHYS: Well, he might have let you go, I guess. Whatever. I guess I'll go back in to talk to HEPHAESTUS. RHYS: Since you're here, though, anything else I should see around town? Or where it is? RHYS: A mall to the right? Got it. Thanks. See you around! The ENGINEER nods and wanders off. Behind you, HEPHAESTUS slowly shakes his head, bewildered. HEPH: Have you ever heard of the Turing Test, Marshal Rhys? 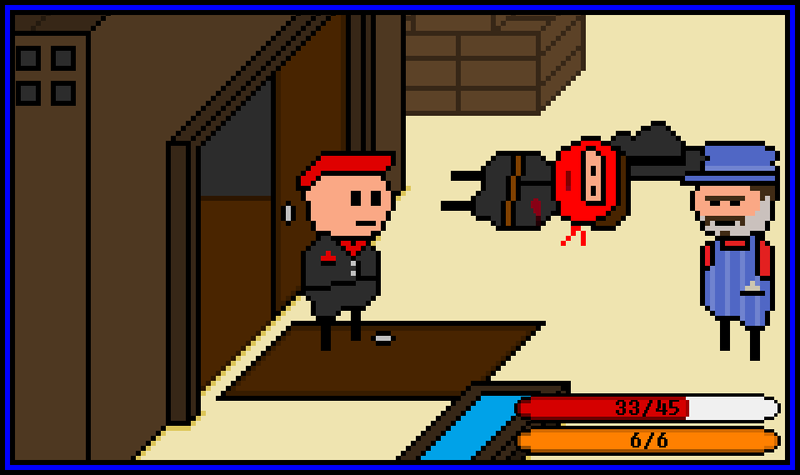 GUN in hand, only the DOOR stands between you and your first combat. You quickly think of a pun. HEPH: Need a quick tutorial? RHYS: No time! 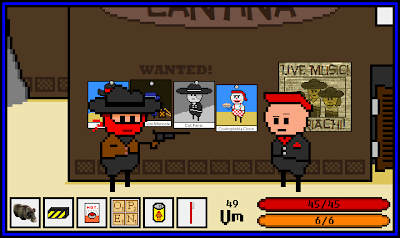 I need to introduce this criminal to my (heh) Revolver Door Policy! RHYS: It, well, it was a pun off of revolving door policy. Didn't quite work, did it? RHYS: Yeah. That pun was lamer than Haephestu-oooh. RHYS: Yeah, I'm just gonna go. You kick down the DOOR! YOU get the drop on BANDIT! YOU attack with VERDI-GRIZZLY! You HIT! BANDIT takes 6 damage! He seems perturbed! 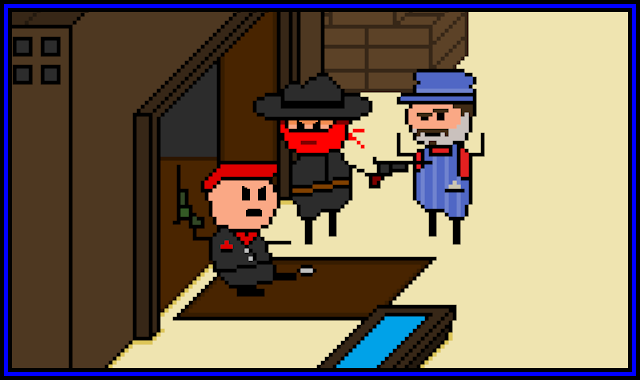 BANDIT attacks with his PISTOL! He MISSES! YOU attack with VERDI-GRIZZLY! You HIT! BANDIT takes 4 damage! He seems displeased! BANDIT uses EXPLOSIVE EXPLETIVE! The sick bomb HITS! You take 7 damage (33/45)! YOU attack with VERDI-GRIZZLY! You HIT! BANDIT takes 5 damage! He seems dead! YOU EMERGE VICTORY THE BATTLE! You got: 22 VARIOUS MONIES! The ENGINEER stares at you blankly. 86 - Quickly run through DOORS and get GUN! You rokkit through the SWINGING DOORS and into HEPHAESTUS' FORGE. You see--- that there's no time for a description! That ENGINEER'S LIFE is in grave danger! RHYS: No time to talk, filthyman! A man's LIFE is on THE LINE! You spy a GUN on the table in the corner and run to get it. What now? You're finally armed and there's ENGINEERS to be rescued! Well, just the one, actually! Still important! Whatever is to be done? >Kick down DOORS and rescue the ENGINEER! Following the SHERIFF'S advice, you head EAST to try and find HEPHAESTUS the blacksmith to get a GUN to take out the BANDITS and the BANDIT LEADER (and rescue TEDDY). You then recapitulate this for yourself. You are standing outside of the FORGE OF HEPHAESTUS. A large CHIMNEY juts out from the building. 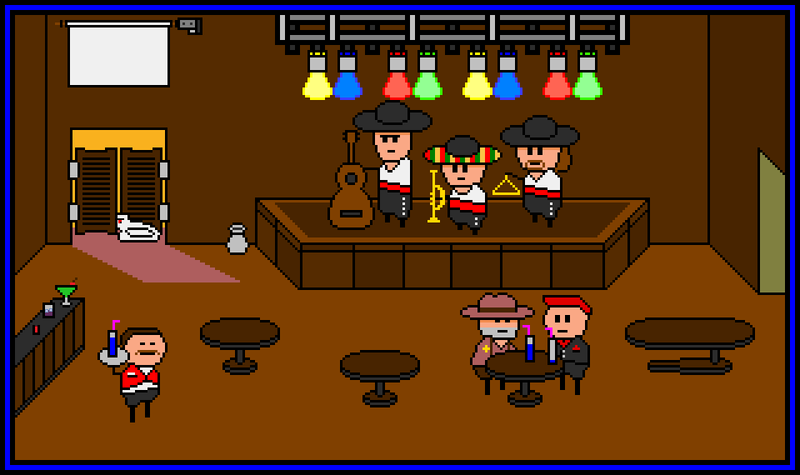 Beside the SWINGING DOORS are a collection of FAVORABLE REVIEWS. At the other end of the building is a WATERING TROUGH. Despite being outside of your field of view, you know a posteriori that a BANDIT is holding up a LOCOMOTIVE ENGINEER around the corner due to the looped threat/response sounds coming from that way. >Quickly run through DOORS and get GUN! You throw your HANDKERCHIEF down, angrily. It wafts gently to the ground. The FIGURATIVE HOLE IN YOUR HEART does not heal. You pick your HANDKERCHIEF back up and put it back in its pocket, angrily. You decide to check your options, pausing to examine your WICKED AWESOME POCKETS. Hmm. The layout is a bit different than you remember. Your WICKED AWESOME SUIT and HANDKERCHIEF are no longer displayed; you obviously have them at all times. Your VARIOUS MONIES are displayed by themselves; your CHANGE POCKET is apparently not usable for anything else. 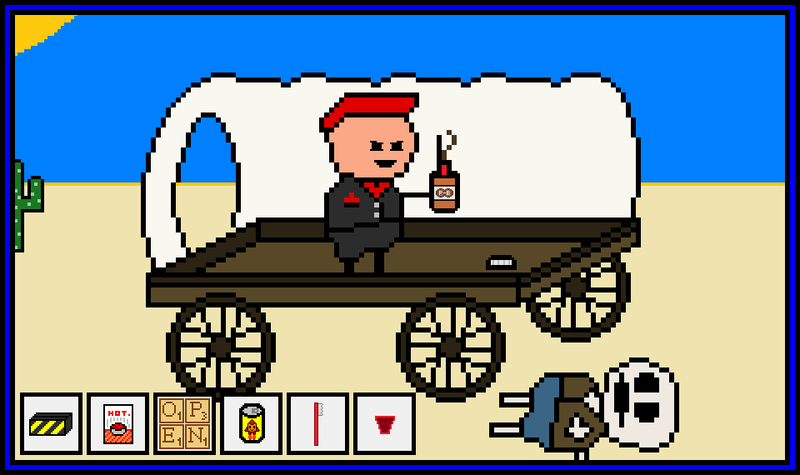 This is somewhat more streamlined than before and you prefer it handily. Your six usable WICKED AWESOME POCKETS contain a TEDDY BOAR (WITH TUSKS), a TRAP, some SAUCY LITERATURE, four SCRABBLE TILES, a CAN OF ROKKIT JUICE, and a TOOTHBRUSH. A TOOTHBRUSH? When did you pick that up? You also appear to have two bars of some sort, a red one and an orange one. Years of training from your misspent youth flare up--- they could only be HEALTH and ENERGY bars (but not the kind you eat). Uh oh. The BANDIT is eying your 49 VARIOUS MONIES. Better do something--- FAST!!! Ah ha! You attack with your TEDDY BOAR, flinging it overhand at your foe! You HIT! 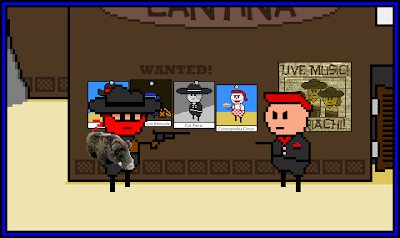 The BANDIT takes 0 damage from the TEDDY BOAR'S SOFT AND FURRY BODY. He catches the stuffed animal. 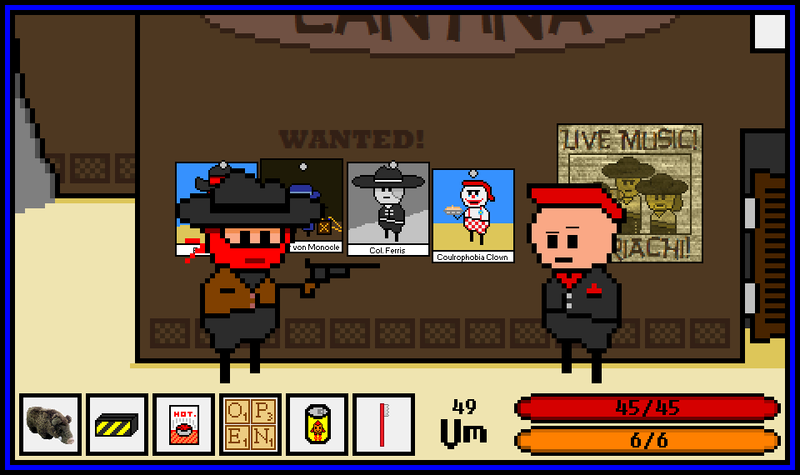 BANDIT attacks with his PISTOL, shooting you with a BULLET! He HITS! You take 5 damage! BANDIT uses GRAND THEFT RAZORBACK! BANDIT flees with TEDDY BOAR! You lose: A TRUE FRIEND! You got: MOTIVATION FOR REVENGE! You lose: FAITH IN HUMANITY! He was with you from the very beginning. It can't end this way. It just can't! RHYS: "TEDDY! You be strong, you survive! You stay alive, no matter what occurs. I will find you! No matter how long it takes, no matter how far, I will find you!" The BANDIT and TEDDY BOAR (WITH TUSKS) are gone. Well what do we have here? There are four WANTED POSTERS on the wall. The one on the far left is for the BANDIT LEADER, your nemesis-apparent. He doesn't seem so tough, and he wears an ugly mask and hat. You may mention that out loud at some point, but you'd like to look at the other posters first. He does look like an idiot, though. Haha. What a maroon. 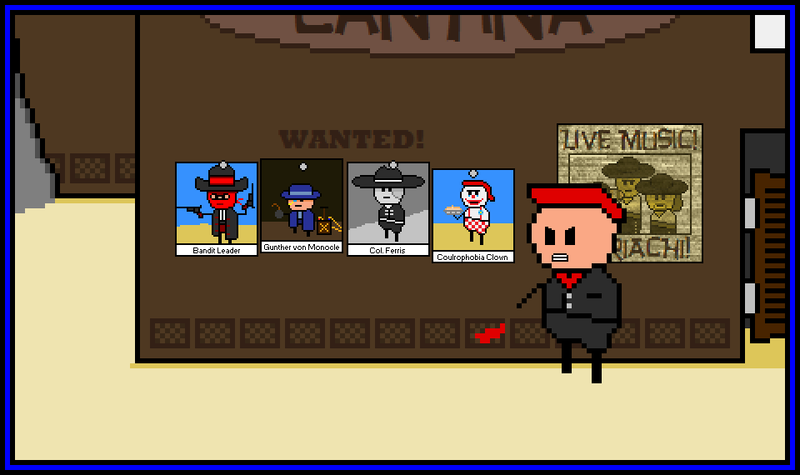 The second POSTER features GUNTHER VON MONOCLE. His modus operandi is quite explosive! Since he uses explosives! The third POSTER is of a COLONEL FERRIS. Apparently he leads a group of AUTOMATONS. Dang! You can't read the last word because someone drew a line through it! A very thin black line! Whatever could he lead a group of? The final POSTER features COULROPHOBIA CLOWN. His LEMON MERINGUE PIE is made with EGGS, which can cause severe allergic reactions such as ANAPHYLAXIS in people susceptible to such things. While COULROPHOBIA CLOWN does carry EPINEPHRINE, which is needed for treatment in severe cases, as a rule he refuses to aid those who his PIES have adversely affected, and also refuses to pick up the empty PIE TINS. He also eats people. 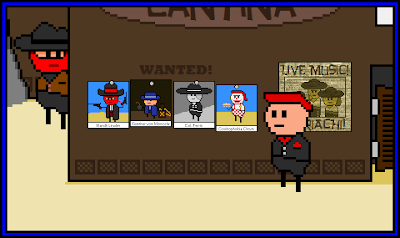 Having completed your perusal of the WANTED POSTERS, you decide that now is a good time to insult that BANDIT LEADER chap. Surely you are safe to do so, as there are none of his minions around to overhear and thus no chance of reprisal. RHYS: Of the BANDIT LEADER, I have the following to say: I have seen many men with bad taste in hats, but I have never seen a hat wearing such an ugly man! You guffaw at this WIT. You drop to your KNEES and hang your HEAD in SHAME. All you wanted was to solve a puzzle involving DRINK ORDERS! Was that too much to ask? You weep a SINGLE TEAR. ...at least the DUCK isn't here to see this. You couldn't bear his DISAPPROVAL, not again. 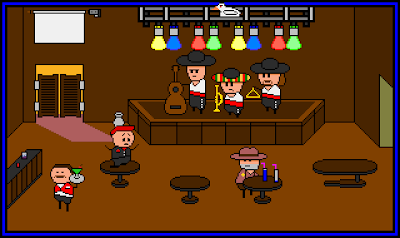 You descend from the table and approach the SHERIFF to see what needs doing first in terms of eliminating the LOCAL RUFFIANS. SL: Well, yer main goal, MARSHAL RHYS, is to take out the BANDIT LEADER. To do that, you'll need to stop other BANDIT ACTIVITIES and eventually track him to his HIDEOUT or SOMETHING. Prob'ly. I'm really just blue-skying here. Why don't you head next door to the EAST and talk to HEPHAESTUS at his FORGE? You're going to need some kinda GUN, and he'd be the guy to rustle one up for ya. RHYS: That sounds good. Oh, and if you see a DUCK around here, let me know. SL: A DUCK wouldn't come in here, MARSHAL. They don't drink. RHYS: In this heat? They'd better! Dehydration is a real problem, especially for WATERFOWL in a DESERT! SL: . . . good luck, MARSHAL. Finally, you make it outsid--- gah! It's so bright! It's like you haven't seen the SUN in 150 years! 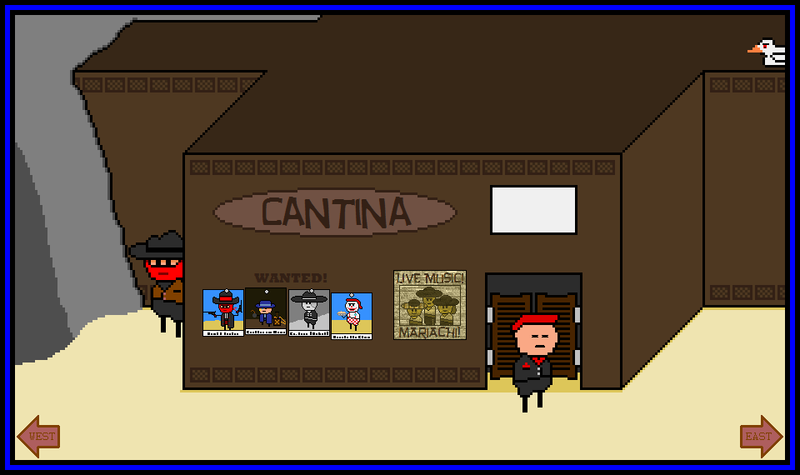 From what you can see, you are standing in front of the CANTINA (which also holds the SECRET ROOM, the VENDATORIUM, and the DARWINIAN REFUGE where you began). 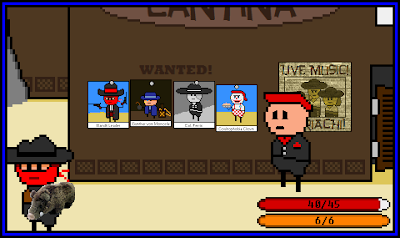 On the wall of the CANTINA you can see several WANTED POSTERS and an ADVERTISEMENT for the MARIACHI. To the WEST, you can see a MINE ENTRANCE; it looks closed. 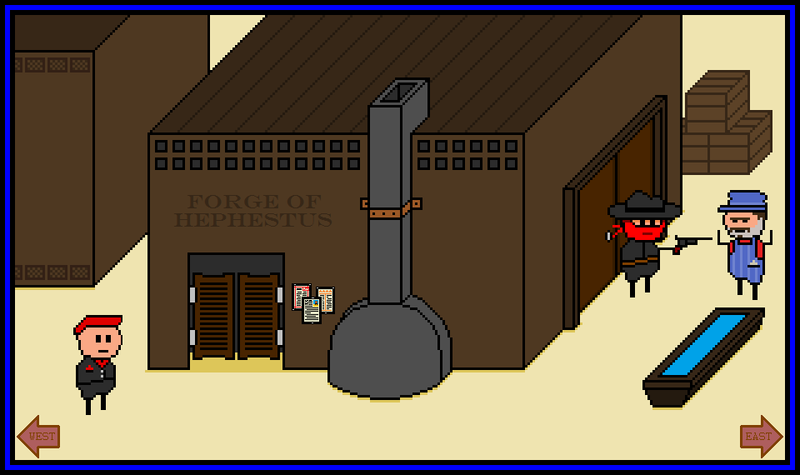 To the EAST you can see MORE OF THE TOWN, including HEPHESTUS' FORGE. For some reason it appears as though the TOWN was laid out in a straight East-West line. Weird. Thankfully, since you're still quite unarmed, there don't appear to be any BANDITS or ASSORTED RUFFIANS loitering nearby. None whatsoever.